Artyzen Sifang Nanjing is opening in China. It’s the first hotel under the Artyzen Hotels brand and its second operational hotel in Mainland China. Located at the foot of Lao Shan National Forest Park, northwest of Nanjing Foshou Lake, the awe-inspiring Artyzen Sifang Nanjing is a 68,000 sqm masterpiece, a short drive from downtown Nanjing. “Artyzen Sifang Nanjing offers the perfect escape from the bustling city life where visitors can take a break and rejuvenate. It also offers a unique stay experience in the green sanctuary of Lao Shan National Forest Park, which is a destination in itself. Architecture and art lovers will be able to visit the Sifang Art Museum and appreciate the architectural collection of uniquely designed villas that bear the artistic hallmarks of 20 world-renowned and local architects. 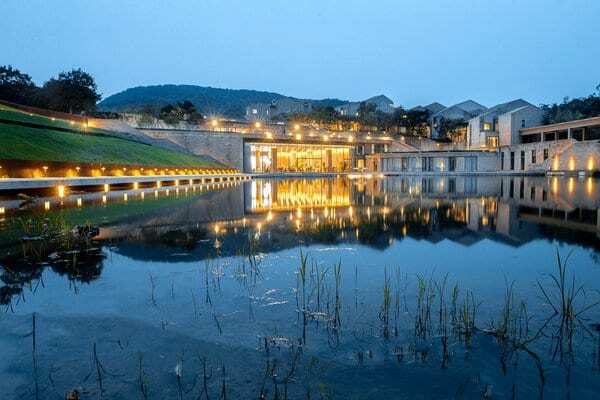 The intertwining of art, culture and nature at Artyzen Sifang Nanjing makes it the best destination in Nanjing to celebrate special occasions and host memorable events,” said Robbert van der Maas, President of Artyzen Hospitality Group. Artyzen Hotels and Resorts is an upscale lifestyle hotel brand that delivers immersive local experiences that inspire the modern-day nomad. The brand provides a contemporary take on traditions and craftsmanship, offering guests a journey of cultural and artistic discovery. Each property is designed to celebrate the unique heritage of its locale, with the design team working closely with local artists and artisans to weave traditional techniques and traditions into modern design concepts. Artyzen Sifang Nanjing is a contemporary architectural showcase of the talents of over 20 award-winning architects from around the world, including Arata Isozaki, Steven Holl, Kazuyo Sejima, Ettore Sottsass, and Wang Shu, the first Chinese winner of the Pritzker Prize. The sprawling property currently offers 91 rooms and will gradually offer 93 more rooms in 20 one-of-a-kind villas, each designed by a famous architect. Guest rooms are bathed in natural light and offer lake views and views of the surrounding woodland landscape.